Hinduisam called as Vaidika, Sanathana or Arsha Dharma is having its origin in the Sacred Vedas and Prasthanatraya, VedantaslUpanishads, Dharma Sutras and Bhagavadgita. Next come the. Ithihasa-Puranas which play more important role for the common man, who were de- prived of celestial and golden treasure .of divine language, the Sanskrit. But it is told "Ithihasa - puranabhyam, vedam samupa brihmayet''. 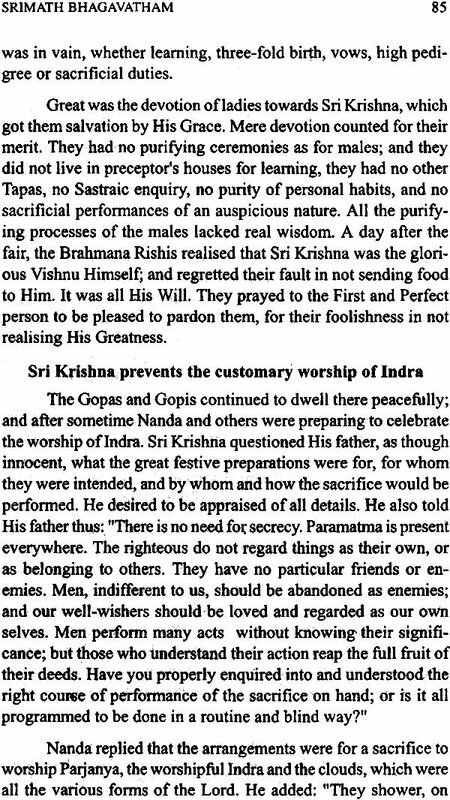 From the Ithihasa - puranas, we can imbibe vedic wisdom. Hence the sacred trio, i.e., Ramayana, Bharatha and Bhagavatha are also as sacred and important as the Vedas or Prasthanatraya. 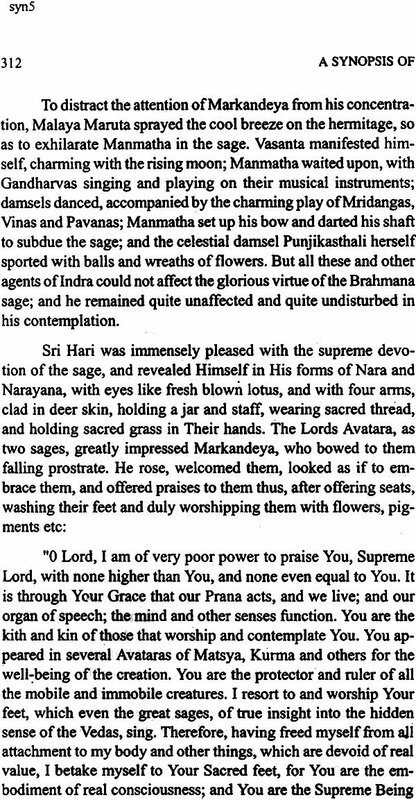 Moreover, the puranas are told in a tell-tale mode and they are lucid in style. Ramayana is embodiment of Karma or Dharma, Bharatha is personified as Gnana and Bhagavatha is the incarnation ofBhakti, the devotion with complete surrender or selflessness, which are the three main scriptural texts of our religion. 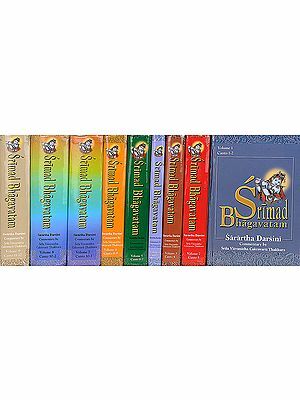 In this context Srimat Bhagavatam is the commentary. Or practical project work of devoted soul in one and all the types of major and minor cults ofBhakti i.e. Utthama, Madhyama and in simple lines, comprising with the tendencies and attitudes of the ten incarnations of Sri Hari, depicting one and the same profound intellect. Dvaparayuga statesman and the Jagannataka Suthradhari, Sri Krishna. The inspiring story of this divine Almighty, Sri Krishna is highlighted in the Tenth Skandha ofBhagavatham where- as the preceding nine skandhas narrate other seven avatharas. The mystique and ethics of avatara and the splendour of devotion are exquistely interwoven in the texture of Bhagavata. This grand epic is indeed embodied in itself Bhagavatha, the God. The word Bhagavatha literally signifies both the God and devotee and thereby establishes the unity in plurality. 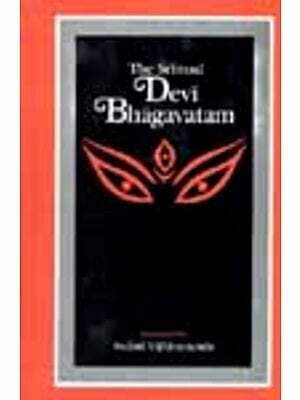 The present book is an abridged version of "Mahabhagavata" which is acclaimed as the encyclopaedia of Bhakti. Written in a clear and simple style, 'Synopsis of Bhagavatam' brings out the essence of this great purana to the readers. We are extremely glad to present the second edition of this book to our readers. The compilation of this work, Srimat Bhagavatam or Srimat Bhagavata Sara Sangraha, which is a synopsis of the sacred scripture, has been completed by the Grace of Lord Sri Venkateswara, and the good wishes of friends, who have been of assistance to us in proceeding with the work. We offer our prostrations to the Supreme Lord, and our sincere thanks to the friends, who have been of good help to us. Among the numerous devotional works, which are the pride and glory of Sanskrit literature, Srimad Bhagavatha is a monumental work of outstanding value to the humanity, especially in this fallen Kali age. We have compiled this work after a close study of the subject in several volumes. We have however to ad- mit that, the compilation of a- great work in a foreign language can never bring out the charm of the original, however skillfully the compilation is done. We shall be satisfied if it shadows forth the spirit of the original in its prominent feature. We have attempted to give a very faithful rendering of the original; and we hope that it will reflect, however faintly, the real tone and spirit of the original work. We have endeavoured to maintain the dignity and tone of devotion, which is so characteristic of this sacred immortal . Scripture. The devout readers are requested to overlook any inaccuracies in the book, which creep in due to the nature of the vast work and the humble capacity of the compilers. Sri Vedavyasa, also known as Sri Krishna-Dvaipayana, is the author of the original glorious work-Srimad Bhagavatha. 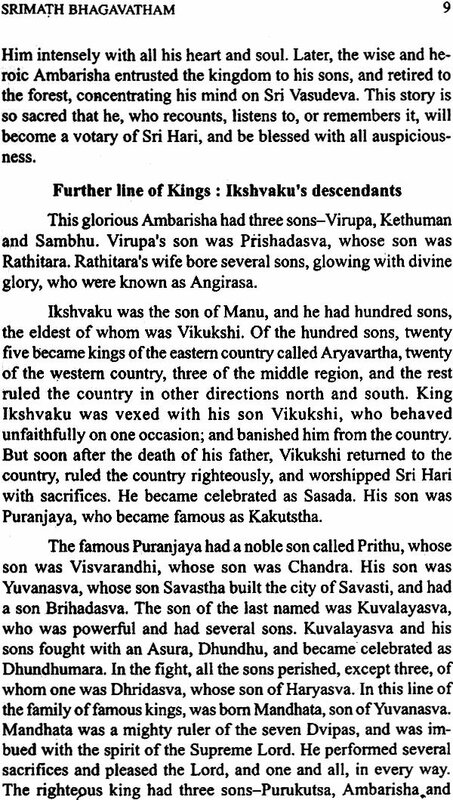 He was an Avathar, born as the son of Sage Parasara, about the. 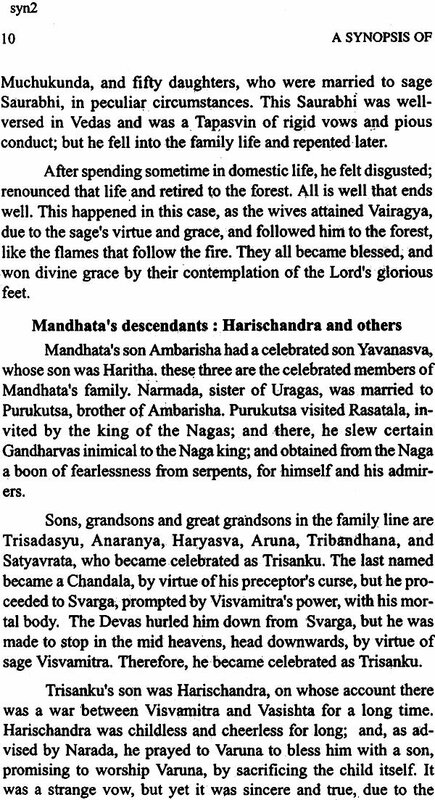 End of Dvapara Yuga, by His wife Satyavathi. With the coming of the Kali age, general deterioration set its foot on the land, by way of the diminution in the potency of material objects, and the de- generation of the people, who had grown irreverent, weak, dull-. Witted, short-lived and unlucky. To suit the times, Sri Vyasa divided the original extensive and composite Veda into four parts (Rig, Yajus, Sarna and Atharvana), and taught them to four different disciples, to master and propagate them to four different sections of the Brahmanas. The division was made with a view that even men of poor merit might be able to retain the scripture in parts at least. Next, Sri Vyasa wrote the Mahabharata and other Puranas. In spite of all these compilations, He was not satisfied and felt that something more was wanted for this world of Kali age. On a discussion with Sage Narada, Sri Vyasa concluded that although the Vedas, Itihasas and other Puranas gave a narration of the his- tory of the universe, facts, truths and Dharma, the Glories of the Supreme Lord of various names and forms, in His various Avataras, had not been adequately sung, to be of sufficient benefit to the degraded humanity in the Kali age. Thereafter, Sri Vyasa com- piled Srimath Bhagavatha Purana, which is the foremost of the eighteen Puranas. 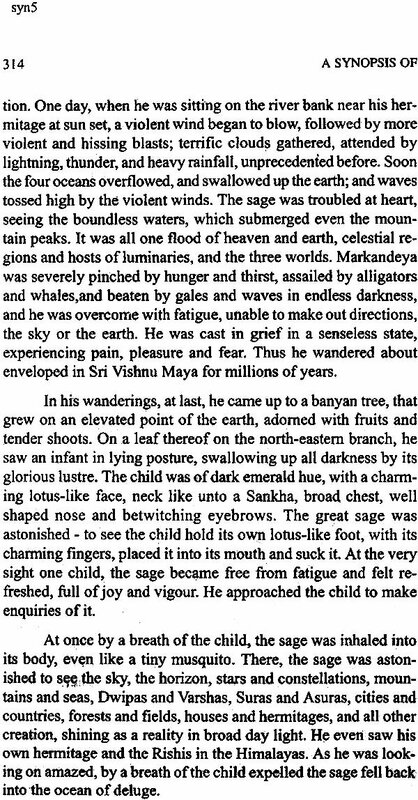 It consists of twelve Skandhas or parts, each containing several chapters. It is assigned the first place, as it is conducive to the four objects of human pursuits of religious merit- Dharma, Artha, Kama and Moksha. The supreme religion is Bhagavatha Dharma, which is the religion of God worship. In fact, it is a Divine nectar, and is itself a Kalpa Vriksha, brought to the earth for the benefit of the God-minded mankind. Reading of, or listening to, this sacred book will please the Supreme Lord immense! 'i. It is substantially claimed that worship of, or even the presence 0 f, a copy of the scripture in the house, wards off all evil influences; and blessed will be the inmates of the household with peace and plenty. Duties efficiently performed, according to Varna and Asrama Dharmas, please Sri Hari. Therefore, one should ever sing or hear the praises of, meditate upon, and worship, the Lord, who ever protects His devotees. Constant meditation on Him cuts asunder the evils of Karma and develops a longing for His stories, which purify the devotees, in whose hearts, He will abide and uproot evil propensities. Sri Hari alone is the supreme bestower of all auspiciousness for the devotees. Of all Puranas, the best is the Bhagavatha Purana. Out of the twelve Skandhas of it, the tenth Skandha is the most sacred and valuable for the reason that it narrates exclusively the most glorious deeds and the most auspicious stones of the Most Su- preme Lord, Sri Krishna. Hearing His glories is a' sure cure for agony of the mankind. Only wise men, who withdraw from worldly enjoyment, experience Divine Bliss. Once the joy of embracing the Lord's feet is realised, one would not think of abandoning them; and he will never forget the sweetness of the Lord's feet. The Supreme Lord is the real strength of our heart and soul. So is our need to worship him with devotion. In fine, we wish to express the hope that this work may be of some use to those, who, on account of their lack of familiarity with the Sanskrit language, find it difficult to read the original for themselves. Even those, who are acquainted with Sanskrit may, now and then, use this work for light reading. If this book will serve to draw at least a few readers to the invaluable treasures of wisdom, prosperity and auspiciousness, contained in this sacred work, we shall feel highly satisfied that our humble labour has met with more than due reward. For a glimpse of the importance of this vast work, an introduction to the glorious scripture is given below. May the Supreme Lord 'Sri Krishna and the Exalted Lord Sri Lakshmi Venkateswara bless us all with Their Grace. Srimath Bhagavatha is a glorious Purana-which is known as Paramahamsa Sarnhita or the book of God-realised souls. It consists of twelve Skandhas or parts, each containing several chapters. This Bhagavatha Purana is the foremost in sacredness, and it is held in the highest esteem by all Hari-Bhakthas. After the four Vedas, the Upanishads recognise the Puranas as the fifth Veda, as they are the authority on divine and religious matters. Dharmasastras are based mainly on the Puranas. Yagnavalkya therefore assigns the foremost place to the Puranas, among which Srimath Bhagavatha occupies the first place, conducive, as it is, to the four objects of human pursuit-religious merit, earthly pos- sessions, sensuous enjoyment and final beatitude. Our Most Supreme Lord, Sri Krishna has enjoined that one should listen to Srimath Bhagavatha daily full of reverence, as that will please Him most. He has ordained that a person who recites a single verse from the Bhagavatha Purana attains the merit of reciting all the eighteen Puranas. The daily recitation of one half or a quarter of a verse from Bhagavatha earns the merit of the gift of a thousand cows; and, the recitation of even a single letter of a verse earns the merit of a Godana. The presence of a copy of the Bhagavatha book in the house wards off all evils; and men who worship the book in their house, are thoroughly purged of all their sins, and are even adored by the Devas. The spirits of one's forefathers will be blessed with the drink of milk, butter, honey and sweet water, so long as the sacred book exists in one's house. When, in the Kali age, the people are subjected to all evil influences, they are wise, who keep a copy of the Bhagavatha Book in their house and worship it, as the Supreme Lord stays there all the time, along with other Divinities. The abode becomes sacred as all the virtues of sacred rivers, lakes and Kshetras abide there. The glorious and holy Bhagavatha confers on Bhakthas health, prosperity and longevity, freeing the persons from all sins. 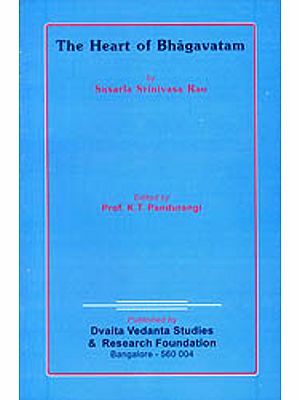 Sree Vedavyasa is the author of Srimath Bhagavatha, the most sacred of all the eighteen Puranas. The Supreme religion is Bhagavatha Dharma, which is the religion of God-Worship. The Purana deals about the Supreme Lord, from Whom the universe springs up, in Whom it abides, and into Whom it returns. The Omnipresent and Omnipotent Almighty, who is Self-conscious and Self-effulgent, first revealed the four Vedas and other scriptures to Brahma, who propagated them to the world for the benefit of mankind. While it is difficult to realise God in one's hear by other means, the blessed soul can easily have realisation b) real devotion to Bhagavatha, which is a Kalpa Vriksha dropped to the earth for the benefit of the mankind. It is Divine nectar. 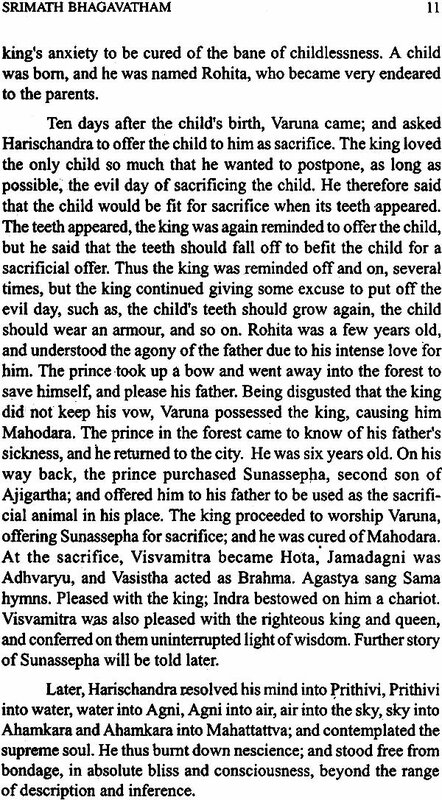 In the great forest of Naimisaranya, a great sacrifice, lasting a thousand year was once celebrated. Several seers and sage! Had collected. On this occasion, Sri Saunaka and other Sages reo quested Sri Suta Mahamuni to expound Srimath Bhagavatha Purana, which is a means of supreme good for men. In this Kali age, the people are mostly short-lived, slothful. Dull-witted and unlucky; and they are tormented with diseases and other evils. The blessed stories of the Supreme Lord ward of] the evils, purify the men's hearts, and give them peace and plenty When Sri Krishna's mortal frame had left the material world fOJ His Heavenly Abode, the cursed Kali Yuga began. Therefore, the sages desired the purification of themselves and their clan, b) hearing the sacred discourses about the Most Supreme Lord, Sri Krishna, from the mouth of the learned Sage Suta. Sage Suta was very pleased with the request, as he was thereby enabled to expound the sacred Bhagavatha as a blessing to himself, the sages and all the world. The scripture is a mysterious Purana, possessing the glory of its own and constituting the very essence of all the Vedas, illuminating the spiritual realities for the welfare of the world. 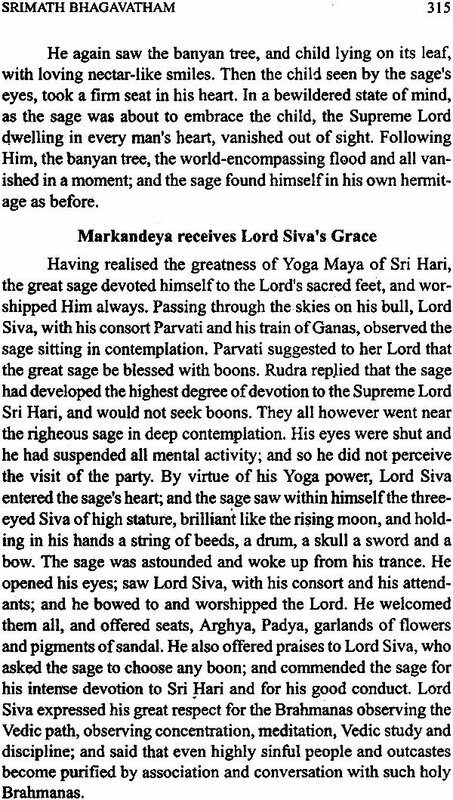 The sage reverently bowed to Sri Suka Deva, son of Sri Vedavyasa, the Supreme Lord Sri Krishna and goddess Saraswathi; and inaugurated the discourse, which is conducive to the welfare of the world, and which purifies human hearts, induces devotion to Sri Hari and enables the soul to realise the All-Blissful Lord. Duties efficiently performed according to Varna and Asrama Dharmas, please Sri Hari. Therefore one should ever hear and sing the praises of, meditate upon, and worship, the Lord, Who ever protects His devotees. Constant meditation on Him cuts as under the evils of Karma, and develops a desire for hearing His stories, which purify the devotees, in whose hearts He will abide and uproot evil propensities. The mind is then free from the passions of lust and greed, which are a result of Rajas and Thamas. The moment a man realises and sees God, his knot of ignorance is cut, his doubts dispersed, and the entire stock of his Karmas liquidated. Sri Hari alone is the bestower of the Su- preme good for men. Therefore it is that the sages of yore worshipped Sri Har~, Who is pure Sattva personified, and Whose, mere Grace makes men blessed. The Vedas treat of Sri Vasudeva ultimately, the sac- rifices aim at the realization of Him, the various Yogas lead to Him, all rituals aim at His Grace, all wisdom is to please Him, He is the goal of all austere penance, and all destinies culminate in Him. It is He, by whatever name you may call Him - Sri Hari, Vasudeva, Vishnu, Rama, Krishna, Govinda, Narayana, or any of His innumerable names, who creates to different worlds, descends by way of His sport in different forms and Avataras, and protects all the beings in His creation with the best of His Grace. The Supreme Lord's Avataras When the Supreme Lord desired the creation of the worlds for His sport, His will manifested itself in the springing up of Brahma from the lotus of His navel. He was the ford of the pro- genitors of the world. The Lord Himself was visible to the divine eyes of the blessed Yogis in numerous forms, with a thousand heads, ears, eyes and so on. For the welfare of mankind and other creation, brought forth by Brahma, as willed by Him; the Lord Himself manifested in the world at different times in various Avataras. To bless the righteous and punish or annihilate the wicked, the Lord has taken several Avataras, a few of which are the Matsya, Kurma, Varaha, Narasimha, Vamana, Parasurama, Rama, Krishna and Buddha. The latest of the Avataras is Sri Vyasa, son of Satyavati through Parasara, which has followed closely on the heels of the manifestation of the Lord as Bala Rama and Krishna, preceding the advent of Kali. The coming Avatara is. That of Sri Kalki, towards the end of the cursed Kali Yuga, with a view to deluge the enemies of the Lord, at a time when the kings mostly turn into robbers. The sportive pastimes of the Lord are always purposive. He creates perserves and reabsorbs the creation, but He never gets attached to the creation. His powers are infinite. That man alone can know His ways, who inhales the fragrance of His Lotus Feet, through constant and sincere devotion. Those that have un- divided love for the Lord never fall again into the terrible Samsara of births and deaths. Sri Vedavyasa composed the Bhagavata purana, which is on par with the Vedas and contains the excellent stories of the Lord. Vedavyasa taught this divine Purana to His son Sri Sukadeva, who is the foremost of the realized souls. 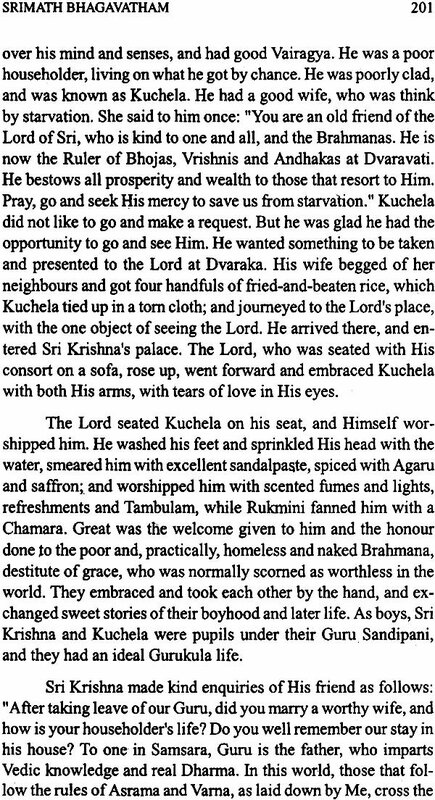 This crear of all the Vedas and Itihasas was recited by Sri Suka to the royal devotee Parikshit Raja, who sat on the banks of the Ganga, along with other great sages. 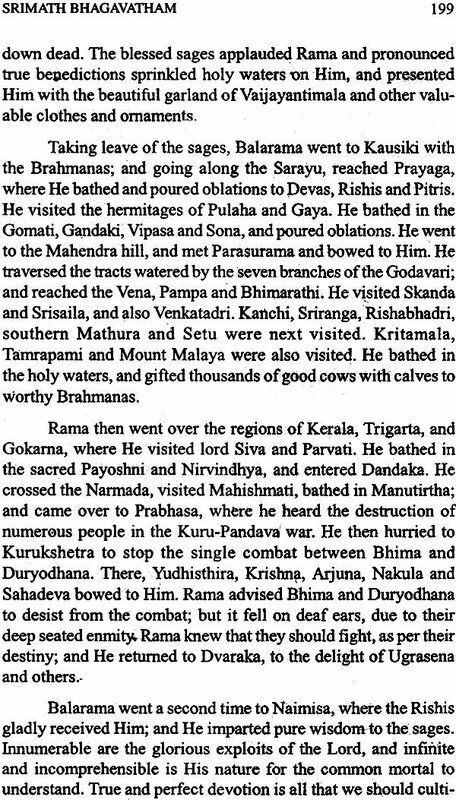 Sri Suta was among the Mahamunis present there to hear the Purana, and this Suta Mahamuni expounded Bhagavata to Saunaka and other sages gathered at the sacrifice in the Naimisa forest. Sri Vedavyasa The assembly of sages headed by Saunaka requested sage Suta to give them an account of the glories of the Supreme Lord, as he had heard them recited to king Parikshit by Sage Suka, and the circumstances leading thereto. 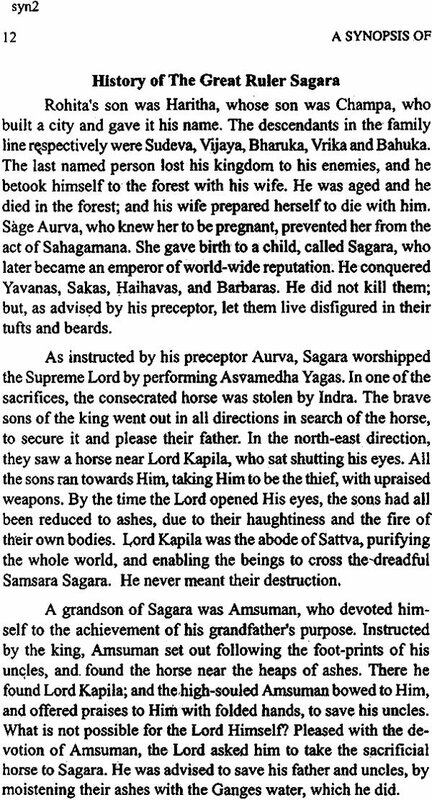 Sage Suta narrated that at the end of Dvapara Yuga, Sri Vyasa was born of Satyavati by Parasara. When sitting lonely at sun rise on the banks of the Saraswati river, he pondered over the deterioration in the world-diminution in the potency of the material objects, marked deterioration in the people, who had grown irreverent, short-lived and unlucky. He planned for the welfare of the mankind, which could not in the backward atmosphere, benefit itself by elaborate Vedic sacrifices for self- purification and benefit. Sri Vyasa therefore divided the original Veda into four parts-Rigveda, Samaveda, Yajurveda and Atharva veda, and taught Paila, Jaimini, Vaisampayana and Sumanta respectively, while Romaharsha (Suta's father) gained mastery over the Puranas and Itihasas, which formed the fifth Veda. The above division of the scriptures was made with a compassion to the men of poor wits, in order that they may be able to retain the sacred scriptures in parts at least. 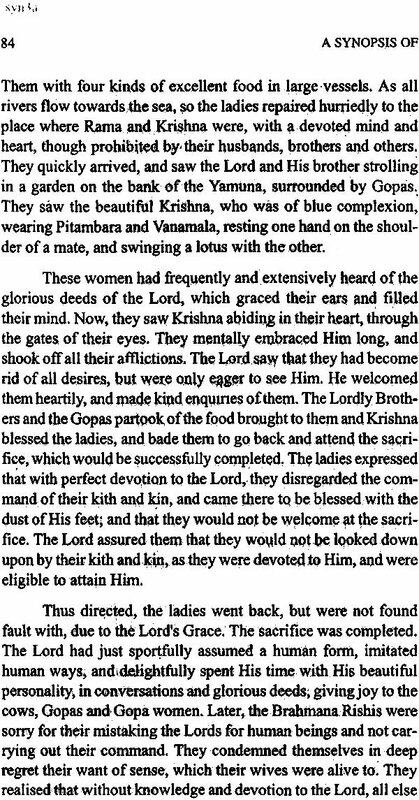 As the fallen Dvijas, women and Sudras were debarred form chanting the Vedas and benefit thereby, Sri Vyasa composed the great Mahabharata epic, through which He intended benefit to them. The epic reveals the purport of the Vedas, conveys the sa- cred knowledge to one and all, and assures them blessedness. In spite of the compilation of the above works, Sage Vyasa still felt dissatisfied and aimed at more benefit for the mankind in general. Then sage Narada by chance called at Vedavyasa's hermitage. The celestial sage was duly received and offered worship. 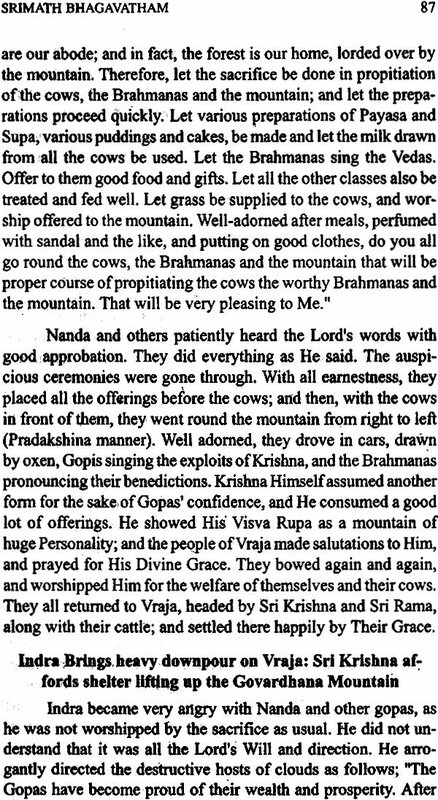 Glory of singing the Lord's praises' Sage Narada made kind enquires of Sri Vyasa and commended his compilation of 'Mahabharata, In spite of the com- pilation of the four Vedas, Puranas, Itihasas and Mahabharata, Sri Vyasa appeared to be without mental peace, and questioned Narada as to the why and wherefore of the great feeling of deficiency. Sage Narada replied that the deficiency lay in the fact that the stainless glory of the Lord had not been sufficiently sung in the previous compilations by Him, which narrated only history, facts, truths and Dharma. Like the swans that have their abode in the lotus beds of Manasasarovar, devotees, who take shelter in the lotus feet of the Lord, ever abide in His heart. The names of the Immortal Lord bear the impress of his glory, and wipe out the sins of the people. Even disinterested action that has not been dedicated to the Lord serves to heighten one's glory and welfare. Recalling the Lord's exploits help the liberation of the humanity.